Look for the brown and white sign pointing to the White River Sylamore Access. Just before you cross the bridge is the public river access. It has a good paved boat launch and parking. Access both the White River and South Sylamore Creek (this is not North Sylamore Creek). At this point you can catch trout, smallmouth bass, and even largemouth bass. You can fish from the bank or the wheel chair fishing platforms. There are two Porta-Potties. Anglers Resort & Restaurant - Anglers is on the riverfront between the two river bridges where Highways 14, 9, and 5 come together. They have a riverfront restaurant with good food at good prices, a combination convenience store and gift shop with lots of fishing bait and tackle, lodging, gasoline, and a trout dock where you can rent a river boat or hire a fishing guide. Call Anglers at 870-585-2226.Mile References From Anglers: 6.4 miles to Hwy 87; 6.8 miles to Blanchard Springs; 7.9 miles to the town Fifty-Six; 8.9 miles to Gunner Pool Road. Decision Time - From Point 19 at Anglers you can take two very worthwhile side trips down Highway 5 to the Ozark Folk Center and the town of Mountain View. Or you can continue on the main tour loop from Point 19 on Highway 14 along the Sylamore Scenic Byway. Or you can do both by taking Highway 5 to the Folk Center, then continue into Mountain View. On the far end of Mountain View you can take Highway 87 ten miles back up a scenic run to Highway 14. From the intersection of 87 and 14 it's a very short run to Blanchard Springs Caverns, which you don't want to miss. Continue The Main Tour Loop for Access To North Sylamore Creek National Scenic River Corridor, Points 19 through 27. 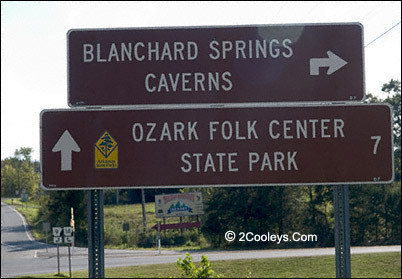 Go straight for a visit to the Ozark Folk Center, turn right for a visit to Blanchard Springs Caverns. You can visit both, as well as visit the town of Mountain View, by using Highway 87 as a connector.